The latest release from Michigan-based indie perfume house Kerosene is Walk the Sea, a fragrance "like high tide dried on skin, memories of the waves, sun and shore." Like all Kerosene releases, it's a unisex scent; its notes include sea salt, white florals, cedar, ambergris and musk. This fragrance is titled Walk the Sea, not Walk the Beach, and I think there's a certain distinction being made there. For me, the "beach" has a whole set of associations that the "sea" alone does not — summer, vacation, suntans, children with sand toys, nearby amusement parks. Walk the Sea doesn't evoke any of this imagery or its accompanying smells and tastes. There's no Coppertone, no piña colada, no cotton candy. Instead, what we get in Walk the Sea is a minimalist evocation of saltwater, sea air, and driftwood. There's some bitter lemon in the very opening, but after that it's pretty linear. There's a naturalistic effect of tangy, salty sea breezes (which, in real life, are apparently due more to decaying seaweed and plankton than to the actual salt in the sea mist). The cedar is quiet and raspy, and the white florals are just a very subtle background note to smooth things out. Walk the Sea feels dry and airy, like an early-spring or autumn day at water's edge rather than a warm and sweaty summer afternoon, and it has moderate sillage and above-average longevity on my skin. I've said this before, and I'll say it again: I shun crowds, excessive heat, and bathing suits, but I love off-season visits to the seashore —and sea-inspired scents. I'd group Walk the Sea with fragrances like Imaginary Authors Falling into the Sea and Jo Malone Wood Sage & Sea Salt; if you like either of those, you should give this one a try. My husband and I are planning a quiet weekend "down the shore" this month, and I'll be wearing Walk the Sea as we stroll the boardwalk. 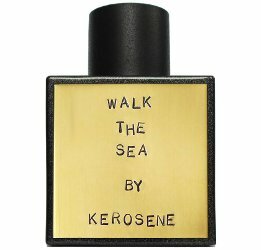 Kerosene Walk the Sea is available as 100 ml Eau de Parfum ($140). (I'm seconding Kevin's wish for smaller-sized bottles from this line!) For buying information, see the listing for Kerosene under Perfume Houses. 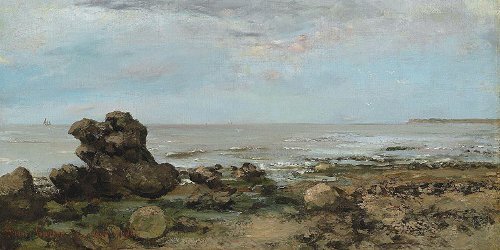 Note: top image is detail from La plage à Trouville by Gustave Courbet via Wikimedia Commons. This sounds nice! Thanks for the review-AND, I join you in wishing for smaller size bottles. I don’t need a 100ml of anything. Thank you! I’m really enjoying my sample. Joining in the wish for smaller bottles (although I remember an indie perfumer explaining once how much more expensive it was for them to sell smaller sizes). I’d grab 50 or 30 mls of this in a heartbeat. The description reminds me of a long-discontinued Ava Luxe perfume, At The Beach, which had nothing tropical about it – it was much more of a chilly PNW beach feel to it. Yes!! I almost mentioned Ava-Luxe The Beach, but my bottle is long gone and it seems mean to talk about something unobtainable…but it’s the closest thing I’ve found to The Beach. I dove right in (????) and blind bought this as I’m a fan of the House of Kerosene. I’d swore off blind buys but the notes struck a cord due to my love of the sea. I’m glad I did as this will be worn quite a bit in the summer season. I do get a bit of sun tan lotion at first but then it becomes a salty white floral on me. Like I sprayed lotion then dove right in. It has been a great compliment getter now that some warmer weather is here. Sea/ocean fragrances that are not Coppertone clones are EXTREMELY my jam! I will have to put this on the “must try” list. hah! I love CB I Hate Perfume At the Beach 1966, and I used to have a soft spot for Bond no. 9 Fire Island (although it lasted about 3 minutes on my skin)…but sometimes I just want the sea, without any coconut or Calone or what have you! Wonderful! Perfume that leans to ambergris and salt, away from the coconut and Calone, that makes my heart sing. So I’ve added Walk the Sea to the top of my must-sniff list. I’ve not yet smelled anything from Kerosene, so this has got my attention. Love the Courbet, and thank you for the review! Yes! The salt “smell” and the use of ambergris are really appealing here. I’m also impressed by its longevity. My skin tends to “eat” perfume, but this one lasts all day on me. This sounds great! I love salty perfumes (Sel de Vetiver and Eau des Merveilles are two favorites), and the cedar sounds like a lovely touch. I’ll have to check it out, thanks for the lovely review! YW! I’ve never been able to pull off Eau de Merveilles on my own skin, although I enjoy sniffing it on others… this is a less complex scent, but so well done. Nice review, J! Somehow, I do not have a FB of anything in this line and I can’t even remember the last time I sampled, let alone WORE, any Kerosene perfume. Perhaps this is THE ONE for me to jump on the bandwagon. I am 100% sure I have a bunch of samples somewhere. Hello P! I like Unknown Pleasures as an “urban gourmand” in cooler weather…and I’m looking forward to trying more from my own bunch of samples! I don’t know here I could try this one but it’s right up my alley for category. Can’t stand sun tan lotion smell. Like the salt sea air. Others I love are Michael Kors Island for that driftwood scent, Giorgio Beverly Hills Ocean Dream, Bond No. 9 Hamptons and Montauk. It is and important distinction to make that the smell of the sand is different from the smell of the sea. What I meant to say was that” I don’t know WHERE I could try this”, and that “it is AN important distinction”. Sorry for the typos. Must’ve been very early in the day. All who like sea scents without the suntan/tropical vibe should check out Penhaligon’s Blasted Bloom and Blasted Heath! A short art film was released when they were launched, which you can see here in Glass Magazine’s review; it’s all about a cold, rocky coast: http://www.theglassmagazine.com/penhaligons-two-new-perfumes-blasted-heath-and-blasted-bloom/. Thank you, OH! That was definitely an interesting duo…and Penhaligon’s really does fantastic little films. Ambergris and seaweed sound fantastic! It sounds like a must-try for me, I love cedar and salty notes. Another favorite of mine is Antonia’s Flowers Tiempe Passate, it has that same salty/amber/driftwood vibe that I adore.. This one sounds good and for a 100 ml bottle, $140.00 is not a bad price as some 30 ml bottles are that much or more.